Momentum is building in the Middle Eastern Modern and Contemporary art market, as more auction houses join in. 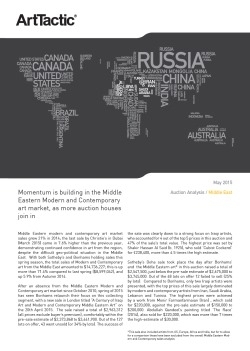 Middle Eastern modern and contemporary art market sales grew 21% in 2014; the last sale by Christie’s in Dubai (March 2015) came in 7.6% higher than the previous year, demonstrating continued confidence in art from the region, despite the difficult geo-political situation in the Middle East. With both Sotheby’s and Bonhams holding sales this spring season, the total sales of Modern and Contemporary art from the Middle East amounted to $14,736,227; this is up more than 71.4% compared to last spring ($8,599,042), and up 5.9% from Autumn 2014. Includes comparative analysis between Bonhams, Christie’s and Sotheby’s.